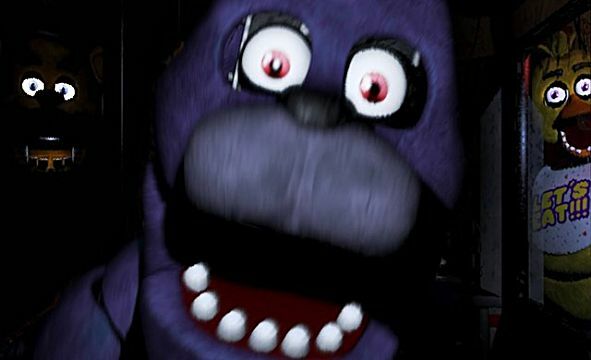 If you've never played Five Night's At Freddy's (FNAF) then you can probably still walk into a Chucky Cheese without wondering if the animatronic mascots are plotting to kill you. FNAF is a point and click horror game which uses a pretty simple formula of providing distractions while forcing the player to pay attention in order to provide a genuinely scary experience. In the first three FNAF games, you take control of a security guard who is working the night shift at a restaurant called Freddy Fazbear's Pizza. The goal of the games is to avoid being assaulted by the animatronic suits who serve as Fazbear's mascots. By using doors, music boxes, ventilation, and other operating systems, you must keep an eye on, and subsequently fend off the restaurant's namesake and his murderous buddies. If you fail to keep the animals from reaching you, you're in for a nasty surprise. Five Night's at Freddy's is famous for the anxiety that it purveys as you frantically check the cameras in order to see if the suits have moved. Not paying attention will lead to hurried camera checking as you try to spot the not so cuddly balls of fur and wires. Camera watching will probably lead to jumpscares that are the standard punishment, or reward depending on how you look at it, for players when they don't monitor their surroundings properly. So which version of Five Nights at Freddy's is the most horrifying? Let's take a look at the candidates and try to find out. 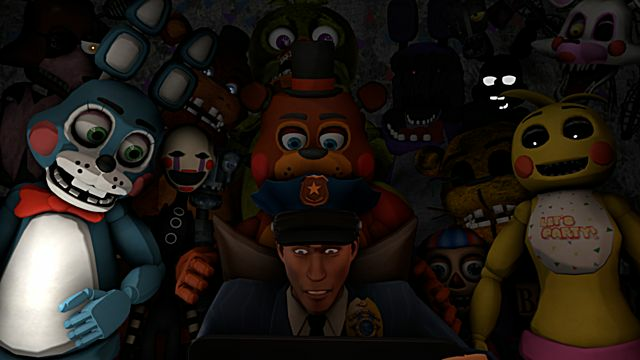 The first Five Nights at Freddy's game was a huge success. 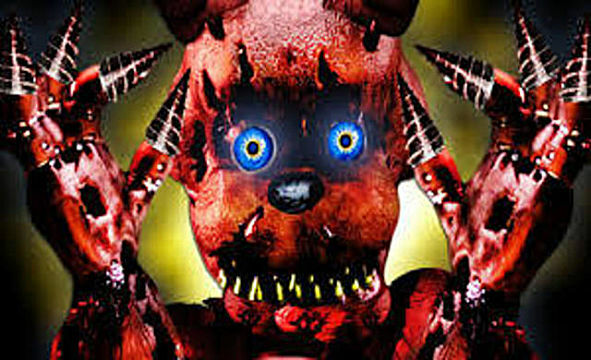 Popularized by streamers and YouTube personalities who chose to brave the long nights alone for an audience, FNAF became known for its creative way of taking things that are generally kind of creepy in the first place -- like pizza places with mascots -- and turning them into nightmares. FNAF only has a few animatronic suits, but this does not take away from the intensity. Experiencing a game like FNAF for the first time is nerve-wracking. Players must open and close the restaurant's office doors and turn the lights in the hallways off and on in order to deter the wandering robots. In a lot of games you spend your time trying to avoid whatever is sneaking up on you, but FNAF tells you that this is going to happen whether you like it or not. It's up to you to keep calm and use your limited power sparingly in order to keep Freddy and his friends out of your restaurant's office that's serving as your asylum. If you fail to keep the animals out you're in for a hell of a night, and after your first failure to keep track of Freddy'n'pals, you might be wary to boot it up again for a second try. 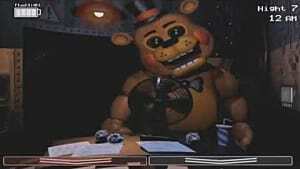 Five Nights at Freddy's 2 takes place before the events of the first game. 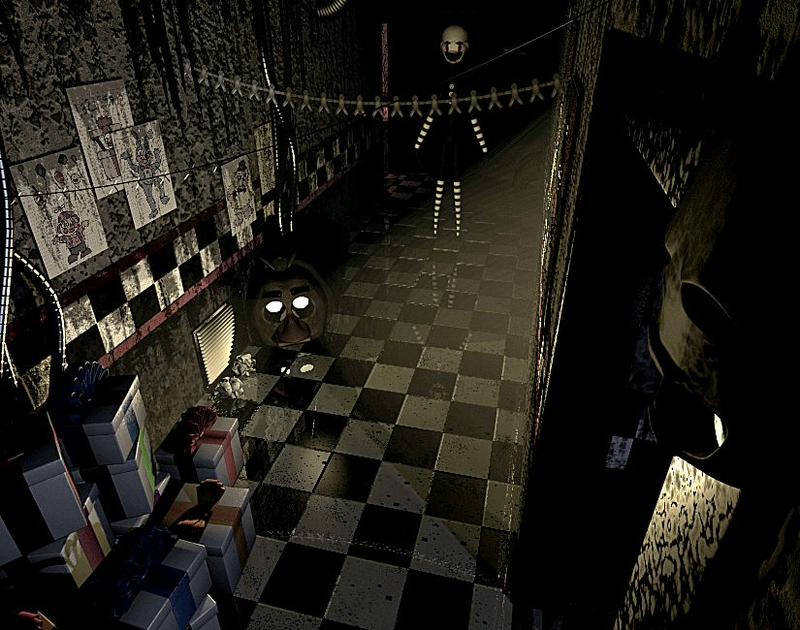 Powered doors are out of the picture, and players of the first game must adjust to newer methods of dissuading the animatronics. 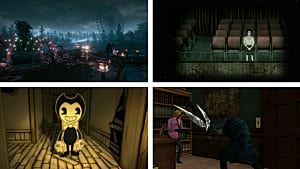 Instead of the ability to block off the character's pathways, you must instead use a Freddy mask, a flashlight, and a music box in order to defend yourself. 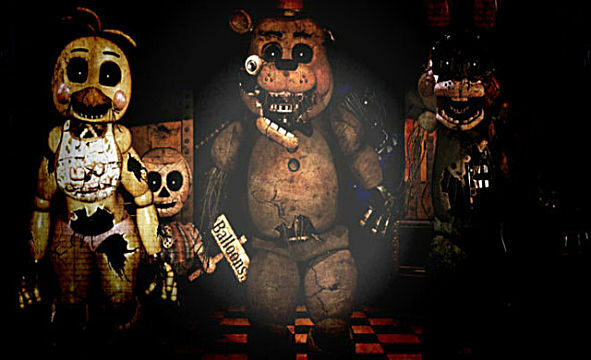 FNAF 2 changes the dynamic of the games by adding a few more mascots to deal with along with the new electronics you must oversee. The addition of the endoskeleton named Marionette is enough to make FNAF 2 just as scary as the first game, even though it keeps pretty much the same formula. 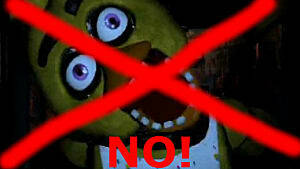 Five Nights at Freddy's 3 veers off from the other games in the series. Instead of dealing with multiple electronic humanoid animal suits that want to assimilate you as one of their own, there is only one baddie wandering the hallways. 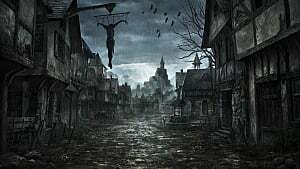 Antagonists from the older games appear, but they are only hallucinations which can't harm the player. 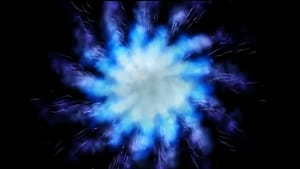 However, these hallucinations can mess with your chances of survival. 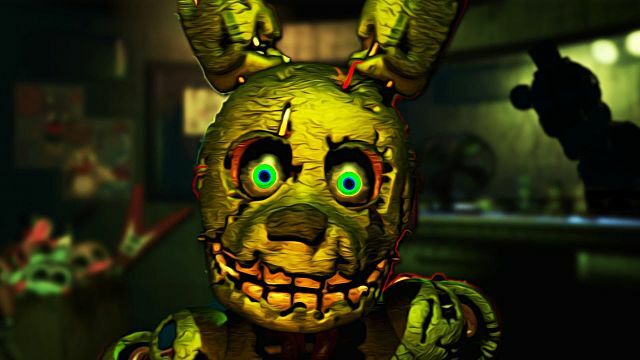 Instead, the task of making players sweat is placed in the paws of Springtrap, a deteriorating rabbit suit whose movements are enough to make up for the lack of bad guys. Five Nights at Freddy's 4 puts you in the shoes of a young boy who has recurring nightmares in which he is being attacked by distorted versions of the previous games' animatronics. 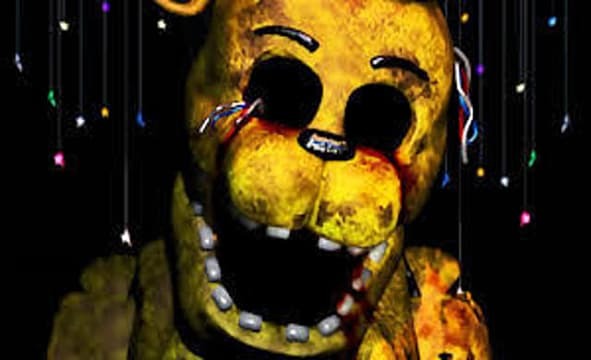 FNAF 4 takes the fear from a children's restaurant and relocates it to a child's psyche. 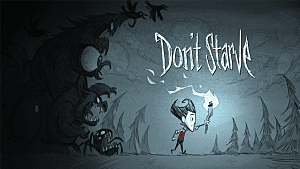 Instead of systems that you must oversee, the player is only given a flashlight. The flashlight has unlimited batteries, and must be used to check the hallways leading into the bedroom, closets where the nightmarish versions of the suits are lurking, and the child's bed which miniature versions of Freddy will sneak onto. So which version of Five Nights at Freddy's is the scariest? It is hard to top the first experience that you have with a game like this. Jumpscare tactics get a little stale after awhile, and because FNAF doesn't really change mechanics to the point where they feel revolutionary, the subsequent games end up feeling a tad repetitive after a few playthroughs. I'm going to say that the first Five Nights at Freddy's was the one that put me on edge the most, but that does not mean that FNAF's sequels are not worth checking out. 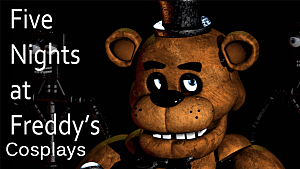 Five Nights at Freddy's 4 does add an interesting psychological aspect to the series. 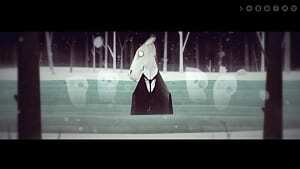 Playing as a child instead of a security guard switches up the way you think about what is going on in the game. If you like horror games Five Nights At Freddy's is definitely one of the best newcomers in a long time. 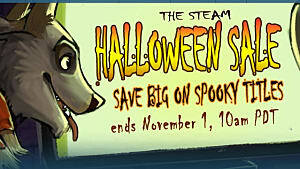 The games are pretty cheap -- you can get them all for $8.49 on Steam right now -- and they don't require a huge time investment in order to have fun. Just leave the lights on.